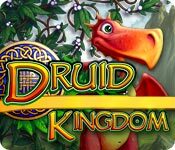 From the creators of the groundbreaking My Kingdom for the Princess series comes Druid Kingdom, a new hit game you’re sure to love! Continue honing your skills and discover a fantastic new plot in this unique genre that combines time-management, simulator, strategy and resource management in four astonishing and colorful fairytale settings! Embark on a magical journey accompanied by new characters: Jack, the young king of the Seven Hills, and his beautiful companion Etain. 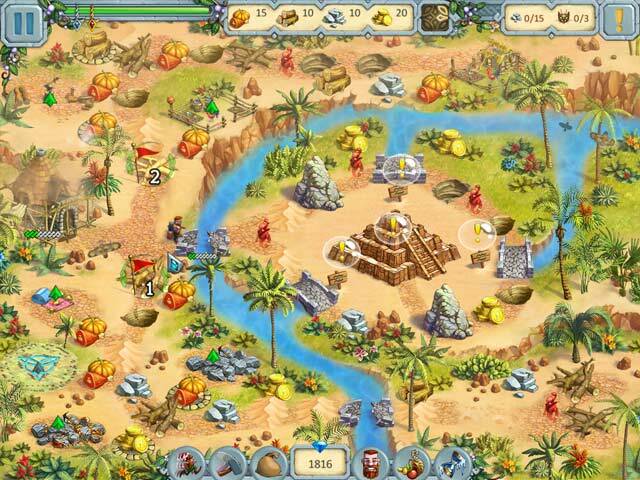 Your quest for the Staff of the High Druid will lead you on an incredible adventure through the mysterious lands of the Druids, the sands of Babylon, the alchemists' country, and the rocks of Alamut. You will fight against evil desert genies, rebuild the Hanging Gardens of Babylon, save the alchemists' country from destructive dragons! Accumulate resources and manage them, keep improving your workers' skills, and set new time records as you learn Etain's secret! Druid Kingdom is rated 3.2 out of 5 by 106. Rated 5 out of 5 by Lucyalicia01 from One of the most addicting games I've been playing this game for a while and I still have a few levels to get a perfect score on. This is one of the most addicting games and challenging on the site for me. I don't know why it only gets 3 stars. The layout isn't exactly like any other game but it reminds me most of My Kingdom for the Princess, which is one of the best if not the best time management game I've played. You earn points to buy upgrades in the game such as starting off another level with more food. You also use those each level for bonuses like running faster and having another worker. One of my favorite things about the game is there are objects each level you can find out of the corner of your eye on the screen. As well as reaching another goal for the level like getting a certain amount of a product. At the end it says to be continued but it seems that will never happen since it's been so many years. Rated 5 out of 5 by Wrenchbendr from Great story! Unique Power ups Fun to play, if a little on the easy side. The story is developed and engaging. Multi-click and sequence is great. Graphics are very nice for this type of game. Rated 5 out of 5 by queenie53 from Druid Kingdom It's a fun and easy game. I've played it dozens of times and never get tired of it. Rated 5 out of 5 by judyj450 from best game i played in a long time it really is a fantastic game! and I have been waiting a LONG time for a good TM game and this is it. like Hercules and Kingdom for a Princess (also love the Northern Tale series and Royal Envoy games) this one really is great!!!! a MUST HAVE! Thx Big Fish! Rated 5 out of 5 by RMPSM10 from Where is the next one? I have loved, loved, loved this game and am waiting for the second one to come out. Anyone have any guesses? Rated 5 out of 5 by godfreygirl from WONDERFUL!! I love this game!! I'm SO glad I discovered this game. I play it almost every day. It's so much fun to challenge myself to be patient and not use the power ups so I can collect the points to buy more resources. I've been patient enough now to buy an add on to each of the buildings....a sawmill, farm, quarry and gold mine. I read some of the negative reviews and it's NOT as they said. You CAN get gold but you HAVE to upgrade your WAREHOUSE. Each time you upgrade it, the amount of resources you collect goes up one point. I didn't discover this until I'd played the levels about 4 or 5 times. And, someone wrote that you can't get to the store to buy power ups or add ons until you finish the game.....yes you can....anytime. You just click on the menu button and then the basket in the lower right-hand corner. That takes you right to the store. Don't be swayed by the negative reviews. This IS a fun game. You may need to play it a few times to get everything figured out. Once you do, it's SO much fun and challenging. I just love this game. I think it's right up there with "Gardens Inc", "My Kingdom For a Princes", all of the "Northern Tale" games and any other of the many time management games I have....this one is just as good in my book. Rated 5 out of 5 by robinj71 from Loved it!! Fun game that I have played over and over. I love that it was challenging but not too hard. I don't like to play games that are too challenging and this one is great! Rated 5 out of 5 by lelajg from Really enjoyed this game. I really like this game. It has fun characters, a good story line, a plot, and cool evil objects to overcome. It isn't too hard, but offers a challenge to casual players like myself. The music is sometimes tiring, but it changes often, and there is one tune that I really like. And once you have mastered all the levels, you can continue to best yourself and build your castle. I'm looking forward to the sequel. Rated 5 out of 5 by Kirland from Delightfully Entertaining TM Game I read all the reviews and thought that this one would be something I would like. I loved it. 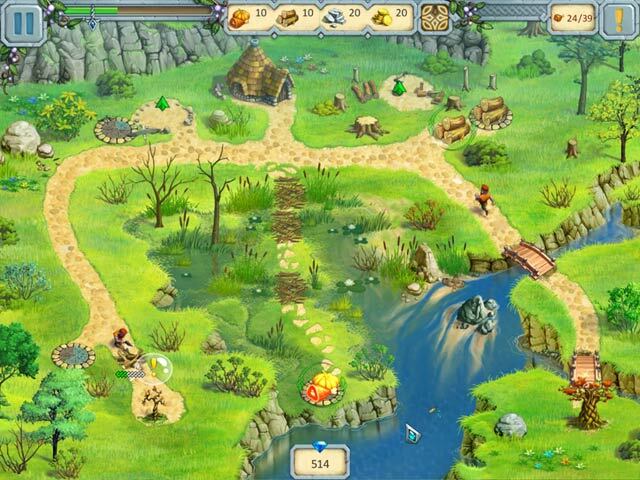 I liked the extra challenge of finding the 3 items (bugs, flowers, wheat, birds). Very cute animated characters and animals. Good fun. I will play this with my grandson. I recommend this game. Good work devs and thanks Big Fish for a fun and entertaining game. Rated 5 out of 5 by tamdolphin from very colorful and fun enjoyed it very much a fun game to sit and play after a long day at work or a relaxing day off. a fun story line not to difficult to add stress but just a over all fun game.